Yamaha RX-V675 review | What Hi-Fi? As the defending champion of the 'Best AV receiver 2012' title, there’s a lot riding on the Yamaha RX-V675. The Yamaha RX-V673 wowed us with its excellent performance-per-pound value, and blew away the competition at this hotly contested £500 AV receiver mark to become an Award-winner last year. Can Yamaha repeat its success with the RX-V675? The Yamaha RX-V675 has all the trimmings of a 2013 AV receiver. This 7.2-channel amplifier delivers 90W per channel of power into 8 ohms, and is future-proofed with 4K ultra HD upscaling and pass-through via the HDMI connections. There are six HDMI inputs in total, five of which are found on the rear panel (there’s one on the front too). The RX-V675 is compatible with 3D video too, and the single HDMI output is also equipped with ARC (Audio Return Channel) technology to reduce cable clutter between your amp and TV. The £500 Sony STR-DN1040 has a higher number of HDMI inputs (eight) and outputs (two), but with rivals such as the Denon AVR-X2000 also offering just one HDMI output, we don’t see it as a shortcoming. There are several analogue connections on the rear panel, including multiple composite and component connections, while there are two inputs each for coaxial and optical digital connections. Cosmetically, the Yamaha RX-V675 is almost identical to its predecessor, the RX-V673. The solidly built 10kg box is available in black or titanium finishes, and its fascia is largely unchanged. The volume control, display, and buttons for quick access to playback controls, radio tuning, source inputs and sound-processing modes are all present on the front panel. The one significant change is that sixth HDMI input – the increasingly popular MHL (Mobile High-definition Link) connection to stream video and audio content directly from Android smartphones. It sits next to the ‘Made for iPod’ USB input, which, as you might guess, charges and plays content from Apple devices. And if you’re partial to listening to high-resolution music files, the USB port also supports FLAC and WAV files up to 24-bit/192kHz. The spec sheet is thorough, then. You don’t have to physically plug your device into the amplifier to play your tunes. The RX-V675 has plenty of streaming options, from internet services such as vTuner radio and Napster, via Apple AirPlay (for streaming from an Apple device) and DLNA support (for streaming from a networked hard drive), to traditional AM and FM tuners, complete with 40 presets. Unlike the Sony STR-DN1040 and Onkyo TX-NR626, there’s no sign of built-in wi-fi on the RX-V675, or of the Onkyo’s unique Bluetooth integration. You’ll have to buy additional adapters for those features, but the Yamaha receiver’s wired ethernet connection will take care of all your network needs. You’ll find the free vTuner internet radio service under the ‘Net Radio’ input, with tunes being played in MP3 and WMA formats from a variety of radio stations. Napster is Yamaha’s subscription-based music service of choice – it’s no Spotify, but it’s a good option to have with over 12 million songs for just £5 per month. As always, we let the Yamaha RX-V675 run-in for a couple of days before calibrating it for review, with Yamaha’s automatic YPAO (Yamaha Parametric Room Acoustic Optimizer) tool adjusting the speaker settings pretty accurately to our listening room. As we let the AV receiver settle in, we browse through the RX-V675’s menus – the icons pop-up neatly on the side of the screen, so there’s nothing to obstruct the majority of the picture. Yamaha clearly takes pride in its digital sound processing (DSP) tech: there are 17 settings, from concert halls and live club venues for music, to Sci-Fi, Drama, and Adventure modes engineered to suit different genres of movies. Extended surround effects and Virtual Cinema DSP modes aim to extend the sound-field further by adding more height or creating a 7-channel surround effect out of just stereo speakers. You have the option to change the sound to some extent too, such as tinkering with the bass, treble and dialogue levels. Dialogue Lift does make voices sound more prominent and in focus, but it might not sound as cohesive as originally intended. Elswhere we’d recommend keeping Adaptive DRC switched off, while the Pure Direct mode is worth a push if you’re using analogue sources only. The free Yamaha AV Controller app for iOS and Android is a must-download if you want easier access to the V675’s menus and surround-sound effects. It lets you quickly switch between inputs and DSP modes from one screen, and browse through radio stations or music folders on your NAS drive. Playback and volume controls are swift to respond, and we found ourselves using the smartphone app much more than the standard remote control for everything other than basic volume control. Put on the Blu-ray of Mission: Impossible – Ghost Protocol, and you’re immediately enveloped in the familiar powerful and rich sound of a Yamaha AV receiver. It’s a big sound, filling up our large listening room easily with powerful dynamics. But it’s Yamaha’s long-standing talent with surround processing that comes to the fore on this V75 Series amp, with the sound effects steering effortlessly across the seven speakers and conveying a great sense of movement. You’re encased in a bubble of accurately placed sound effects, which makes for a thrilling home cinema experience. But the RX-V675 is not completely flawless – there’s a thickness to the sound that keeps nagging us throughout, especially when it comes to dialogue. Voices don’t sound as clear and crisp as we’d like, and we found ourselves fiddling with the volume control to strike the right balance between the dialogue and the sound effects – increasing the dialogue level feels more distorted rather than clearing things up. The overall sound can sometimes feel a bit clogged and heavy with this added layer of weight, and it’s not as agile and snappy as its Sony rival. Luckily, there's a way out of this predicament. We’re usually wary of using sound-processing effects on the native soundtrack of a film, but with the RX-V675 not sounding its best in the ‘Straight’ unprocessed mode, we decided to experiment. ‘Sci-Fi’ and ‘Spectacle’ tended to make things even more bombastic, but we hit the jackpot with the ‘Standard’ and ‘Drama’ DSP modes. The soundfield opens up when in Standard mode, while Drama goes one step further by clearing up that thickness with refined detailed and more articulate dialogue. Both Yamaha sound modes give a big improvement in overall sound quality – the sound has more space to breathe, and it becomes a far more engaging listen while still retaining the rich and dramatic character. That presentation lends itself to stereo music really well, too. Whether it’s streaming over DLNA or playing directly from an iPod using the USB connection, Big Bad Voodoo Daddy’s Mr Pinstripe Suit bounds ahead with lots of energy and punch. What could be bright and tinny sounds smooth and melodic and it’s comfortable to listen to – and particularly forgiving with lower-resolution files. The bass could be a touch tauter, though – the Sony STR-DN1040, for instance, has more control over the start and stop of notes, with a shade more subtlety overall. 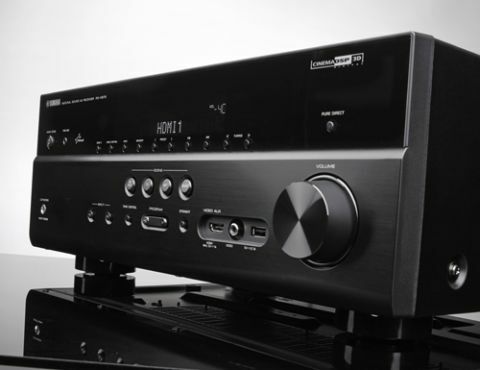 It was touch and go for the reigning leader of budget AV receivers – everything we love about the Yamaha sound is there, but it’s not without some chinks in its armour. Happily, it only takes one DSP mode to fill in the gaps, and the RX-V675 is as fantastic to listen to as ever – particularly with streamed music. While it’s still a leading contender, rival 2013 AV receivers have upped their game considerably and top dog honours will be fiercely contested. But there’s no denying that the RX-V675 is a powerful and thrilling amplifier for the money.